"I remember going to the trading post in the summer with my grandmother to haul water and buy hay for the horses. It felt like a long trip then, but it was only about twenty miles. The roads were very bumpy and dusty, and the whole time I remember thinking about buying candy. My grandmother usually gave me a couple dollars and I could sure make it go far, or so it seems when you are young. When we got there, I would go into the trading post and look around and talk to other kids who were there doing the same thing as me, hauling water, buying hay and food. It seemed like we were there forever, filling the water barrels took a long time. When my grandmother was done, I would help her load everything into the bed of the truck and we would get back on the road to head home. I remember that I was only allowed one or two pieces of candy because I had to make the rest of the money last until the next time we came back." "There are vast differences in how I live today than how my parents and grandparents have lived their lives. I had a very strict Christian up bringing while I lived with my mother's family. We also had very little money on which to live. It was a very difficult life. I then lived with my father's side of the family and learned about the traditional ways of the Navajo people. My father was better off than my mother's family so some of the struggles I had experienced when I was very young were easier to deal with. When I went to high school in Flagstaff I learned about the non-native way of life and lived in the city for the first time. I have been living in Tucson for seven years and I have been exposed to many other cultures and people. I have become independent of my family, yet I still go home as often as possible. I find myself living with modern conveniences and the ability to explore more opportunities than what my parents and grandparents experienced." "There are many traditions that I incorporate into my daily life. One is my native language, that I use as often as I can. My language is very important to me because at home at Black Mesa, many relatives do not speak English. I must use my language to stay in touch with my family and culture. Another tradition I apply everyday is the use of prayers. Every morning I go outside and face the east and pray to the creator for the great blessings onto the four directions. Then, I go running, a tradition representing strength. Another Navajo tradition I follow is striving for the beauty way of life. This means that I always look forward everyday without looking back. I look for the good in all things, people, and situations, and treat others with respect. All of these things are very important to me in a traditional sense." "I was pleased with the overall experience of having my photograph taken. Gary made me feel very comfortable and I felt absolutely no pressure. I was at ease through the whole experience. I was very excited to see the finished results. When I saw the final platinum print it was quite amazing to see. I love the depth of the picture, the textures, and the realism. It reminds me of pictures of Native Americans from the past. Being photographed for such a project (Smithsonian) is very flattering. It made me feel very special and made me proud to be able to represent my people to potentially a vast number of other people from around the world. Also, having a photo that will last for such a long period of time makes me value it as something I can pass on to my family for generations to come." "I am very optimistic for the future. 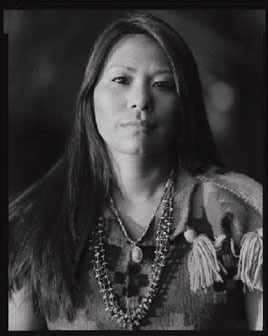 I see Native people earning more and more respect for who they are and for their history. I see more and more modernization of the reservations in terms of utilities, education, and infrastructure. I see recovery and relief from the mining industry in Black Mesa where my father and grandmother struggled to live a traditional life against the pollution and contamination the mines have created on the land. I see many more Native people getting out into the world and contributing to society as a whole, not just to their own people. For myself, I see success in whatever path I am guided down."